is the only official Ukraine currency. In 1996 new currency of Ukraine was introduced – Hryvnia. It is subdivided into 100 kopiyok (1 kopiyka). In fact it is not new for Ukraine at all. Hryvnia was used as official currency in Kyivan Rus almost 1000 years ago. Banknotes are called Hryvnias. They are denominated in 1, 2, 5, 10, 20, 50, 100, 200 and 500 UAH. The size of smaller denominations, such as 1, 2, 5, 10 and 20 is as those of Euro while starting from 50 till 500 banknotes are becoming to be larger. 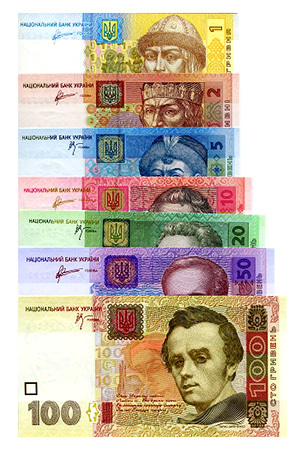 On the one side of Hryvnia banknotes are pictures of most notable Ukrainians in history of this land. You can find faces of Volodymyr Velekyi, Bohdan Khmenlytskyi, Taras Shevchenko, Ivan Franko and others. While on the opposite side there are pictures of important buildings and structures in Ukraine, such as Sofiya Kyivska church, Lviv Opera House, Supreme Council of Ukraine (Parliament), Lutsk Castle and others. One Hryvnia is subdivided into 100 kopiyok (1 kopiyka). These are nominated only as coins of 1, 2, 5, 25, 50 denominations. On one side of Ukrainian coins you can see the number while on the opposite is a Trident – Ukrainiain coat of arms. Althouht there are also 1 and 2 Hryvnias in coins denomination but they are quite rarely seen in turnover. Some people even collect them because it’s so “unique”.